the Alert Program (Williams & Shellenberger, 1996), The Incredible 5 Point Scale (Buron & Curtis, 2003), The Hidden Curriculum (Myles, Trautman and Schelvan, 2004), Thinking about YOU Thinking about ME (Winner, 2007) and other professionals. The Social Express by the Language Express, Inc for $29.99 just for the month of May has taken these different theories and created one of the most interactive, beautifully designed apps. Upon opening it I thought I was going into the set of a sophisticated animated movie as there is an opening scene with characters who play a large part in the app. First set up your user profile. If this is your first time using the app Read through the Social Express Guide and use the website to keep up with new ideas. ( http://thesocialexpress.com/product-listing/features/). The guide will explain the verbiage used throughout the app making it user friendly. Next, return to the student you are working with on Play Lesson. The app has two skill levels. Depending upon who you are working with will determine the lesson you may want to use. Quite honestly many of the topics are appropriate for all elementary school and middle school students. Lessons include working on coping strategies, being with a group, how to talk to friends, how to start a conversation non-verbal cues and more. THe app includes 16 lessons teaching the “social rules” of life with the hidden curriculum behind them. Each lesson comes with a skill level, a hidden social key, a goal, lesson summary and follow up activities to continue working on the skill. The app monitors your progress as you answer questions during a lesson. Throughout the lesson teaching tips pop up. If you do not want them you can turn them off in the upper left hand corner. The lesson uses 2 characters – Emma and Zach and their dog making the students who play feel like they are part of the app. This can be used as a classroom activity or at home. It meets the needs of so many children who struggle with the day to day social skills and decision making. The app makes the student feel as though they already have built in friends, which is extremely comforting. The app is a great way to show video modeling and help with some of the difficult coping strategies of daily life. IEP Goals: During :number verbal exchanges, the student will control vocal intonation and body language to accurately match the intent of the message (e.g., student smiles when conveying something good). The student will practice and use various conversational scripts to maintain a :duration conversational exchange. Plurality by Zorten Software for $1.99 takes 24 plural words and creates them into a memory game for 1-4 players. If you are working with children on the spectrum you can create boards from 2×4 to 5×6. In the settings you also choose how many plural words you feel would be appropriate for the individual child or the group. After a student takes a turn when he/she flips a card you see the singular and the plural of the word. If you do not get a match you get a peek at the entire board if you put that in your settings. Memory games are very important for children. They are more than just fun things your child/ student can play with but instead should be consider the starting point of a childs education. A childs memory is a treasure that should be protected and nurtured until they are able to take full advantage of it. Plurality also encourages socialization which is extremely important with students on the spectrum. This game students learn to take turns and need to focus on their peers turn as it can help them when it is their turn as this is the strategy of memory games. Irregular plurals is part of the Common Core Standards. In second grade under language-Form and use frequently occurring irregular plural nouns (e.g.,feet, children, teeth, mice, fish).Form and use frequently occurring irregular plural nouns (e.g.,feet, children, teeth, mice, fish). IEP Goals: When given written material, the student will identify the irregular nouns. Memory games are always a challenge for children. It is always a bonus when there is a meaning behind the game. It would be nice if the game could have a timer and data collection added for future reference. Splingo’s language universe by the Speech and Language Store LLP. $2.99 has four levels to help children learn listening and language skills . The levels are designed developmentally using one direction at a time.. Level one contains 1 main word such as which or find The child will be presented with two pairs of gloves and asked “which pair of gloves are little ones?” or find a specific item on the tablet. Level one is designed for 18 months and older depending on the needs of the child. Level 2 increases to two directions where students are presented with 4 items and needs to choose the “big” box amongst 4 images. Level 2 is developmentally for children between 2-3 years old, Level 3 is for 3-4 years old and Level 4 is for 4 and up. Of course as you proceed the directions become more involve d and students need to increase their listening skills and ability to follow directions. Splingo allows you to customize the app to meet the needs of the student. You have the ability to increase the number of the nouns, verbs, prepositions, and adjectives when displaying sentences on a specific level. Adding the extra words is helpful for students who may have difficulty with single word directions. After a child completes a few directions they are given a rocket to help build staying with the alien theme. The puzzle helps to increase the student’s visual discrimination and encourages the student to want to finish the puzzle. If you are a special education teacher you may find this app is appropriate for students who are on the spectrum and Developmentally Disabled. Understanding prepositions is difficult for many children. Splingo gives students an opportunity to learn how to process them on four different levels. Examples are put the blue ball under the small bed. The app has a simple data tracking system that indicates how the child is proceeding on each level. Fo those of you who have wondered where the Project Injini team went they have now reunited under a new start-up called Loco Motive Labs. I was thrilled to hear this as I am a huge fan of their previous apps Write My Name and Injini. The company is a NewSchools Venture Seed Fund company. Kid in Story by Locomotive Labs is $6.99. Kid in story is a new way to look at social stories. These stories give you the feeling that they are actual story books on a book shelf about a child. You as the teacher or caregiver add the child and background from your camera roll. After you add the picture you add text and narration and now you have your own storybook that is actually a social story to help your child. The app includes 8 templates for you to add your story to. The templates includes include the Faces I Make showing various facial emotions, Let’s get a haircut one for a boy and one for a girl, Are there Monsters in my Room and more. What makes Kid in Story Different is choosing “real” backgrounds and putting your child in the story making it feel realistic. 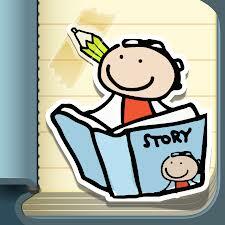 We have found social stories have been very helpful with children on the spectrum and a variety of other special needs. Now we have a child’s favorite activity a book that is narrated either by the child or caretaker with pictures of themselvses. In a addition to a social story you are also creating an opportunity for children to increase their reading skills in a manner that is encouraging and hopefully will address the skills needed for the child to be successful! Do you know? These apps are all FREE for a limited time. apps from What goes together to a variety of flashcards for the iTouch, iPhone and iPad. 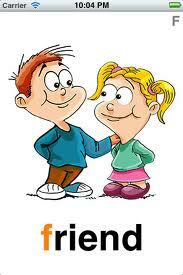 Find Me- FREE- By Interface 3- Great for young children with autism to begin practice with early social skills. The goal is to pay attention while there are other distractions on the screen. Uses simple positive feedback and keeps the stats on the child’s levels. If you want to use your own voice you can purchase this option for $6.99. I think the voices are quite pleasant thought they are from the UK they are easy to understand. Learn to Talk First Words FREE by Thunderloop- Here is a great free app with 160 flashcards that can be set up alphabetically or by category. The graphics bright a inviting. Each word is highlighted with the beginning letter. If you touch the upper right corner the card flips over to see both the upper and lower case letter. If the child wants to hear each letter they just need to touch the first letter and then each letter there after is said and then the word is repeated. If this is a hit there is a second edition for $1.99. For the iTouch, iPhone and iPad. Stay Tuned for more FREE apps tomorrow! !